Great buys and a great setting await shoppers in northern Illinois near-ish to my home--and I will share my story about one of the most unusual places I troll around for treasures. I know YOU know I can’t tell you name and location-and probably you, Dear Reader, already even know who she is and where I am talking about. I am describing a farmette in northern Illinois that is a treasure trove for antiques and a curious and attractive setting at the same time. I know very little about the seller--other than that she has an eclectic life, and has a great eye for finding the unusual decorative piece and the complete knack for knowing how to price it right. Let’s call her Lady Farmer. I NEVER see something and pass it by because it is priced too high. And I am looking for the wholesale prices because I resell. Lady Farmer lives on a little island in the middle of madness--surrounded by farm buildings and wild flowers and free range chickens and the odd goat and peacocks. Real peacocks--kind of like one of my new found favourite authors Flannery O’Connor. This dealer is constantly--I mean CONSTANTLY rearranging and moving her inventory and adding to it several times a week. I think she has a couple of friends who also sell in the farmette--as I see a few different names on tags. The farmette has several buildings--a huge very old dairy barn, a chicken coop, some garden sheds, an old house and another old house all sprinkled on the property. Each building has a theme--garden, men’s things, victorian and just eclectic. Year round--absolutely year round-- our Lady Farmer opens her shops, turns on some calming new age or Native American based music and offers browsers a freshly baked chocolate cookie. Year round. I think when Husbola come with me--he eats two. Lady Farmer gets it totally right. I don’t know how financially successful she is--but items I saw last week do not last into the following week. She retired a few years ago--but now is back like gangbusters. Lady Farmer understands the business. Stale merchandise priced like it is still 1995 is the death knell. Collectible do-dads that collect dust are going further and further out of favor with today’s shopper. Her customers are of all ages--a real coup in itself. She puts unusual things in attractive vignettes and shows people how the items will look in their own home. Her prices are great--I never ask for a dealer discount which in most shops amounts to about 10 percent off. She finds it--she sets it out and cleans it up--I make money off everything I buy--somehow it just does not seem right to ask. Lady Farmer’s customers are very lucky. For a short time we are transported into a different time and place--and most times come away with antique treasure. Do you know who she is? Shhhhhhhhh. I wonder if the term "be-backer" is exclusive just to the antiques trade? A be-backer is a customer who enters your selling space-- at a a show--and has some sort of personal contact with the dealer over an antique for sale. The be-backer has asked a question about an antique--inquired on the item details or age or origin--or maybe even asks you about a better price. Then --instead of saying "I'll take it" they instead say "I like that piece--I'll be back." These people make us nuts. They might as well say "Thanks--I am NOT going to buy it" They have no intention of returning to buy it--it is just a more gracious way of them moving on without the purchase. They say they will be-back instead of "good grief your price is to high" or "it isn't what I thought and I don't like it". Trust me--antique dealers would just wish they would say "no thanks" and move on. Dealers always hold out hope that the be-backer really WILL be-back. And hope they bring their check book and pull the trigger and complete the sale. More times than not--if the person does return to look at the item again--they have brought a spouse or a friend and that is surely the deal maker or breaker. Friends normally say --buy it--and spouses normally say -forget it. When fellow dealers congregate at a show--in the general schmoozing that happens during a business lull--many times in comparing sales or customers--the be-backers will be quantified--"I've had 10 sales and two be-backers" or "Sales are slow--but maybe two of my be-backers will help to make the show." Or--best yet--"You won't believe--a be-backer actually came back!" For the past couple of years, Husbola and I travel in late winter to central Illinois to an itty bitty town near Champaign to attend The Perfect Antique Show. Last weekend was just such a trip. The town is in the middle of Illinois Amish Country and the show is actually held in a building the Amish folks built and rent out to various groups throughout the year. 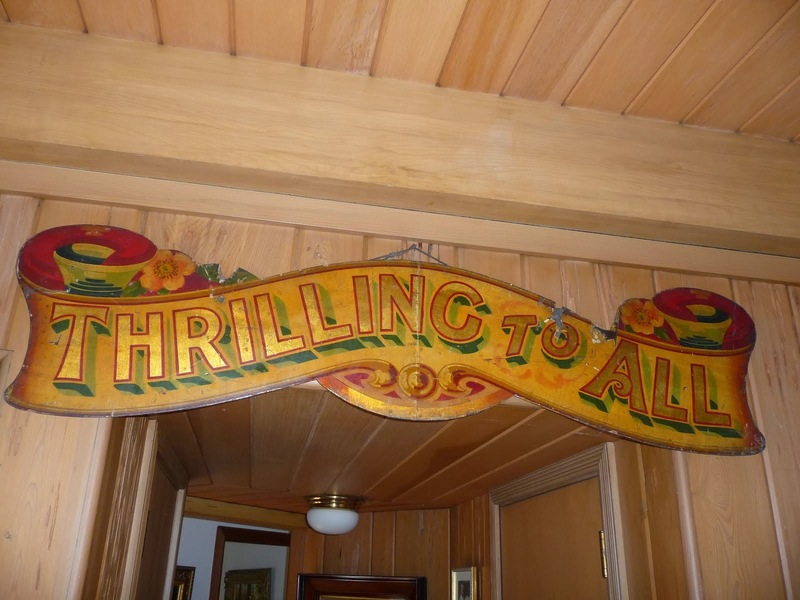 This antique show has the perfect number of dealers--at the perfect time of year when everyone has cabin fever--in a quirky little town--with good antiques and well priced affordable merchandise. And it is out of our usual shopping area. It is a good thing to attend an auction, show or flea market where you do not recognize every other buyer. This allows us to buy items that may sell to our retail customers back home--but may also be bought by other of our dealer acquaintances. Why is this show so great? First--they open the show at 8am. Antiquers are not folks who sleep in. It is a one day show which equals PERFECT in our book--and it only runs till 3 in the afternoon. If you see something to buy at a one day show--you better grab it--as you will not be able to think about it overnight and go back. The show is well lit--the booths are spacious--and they have opened two additional areas to accommodate more dealers. 40 dealers equals perfect size. We were in line early--about 7:15am. This makes Husbola nuts as he just hates to stand in line for anything. But we have traveled all that way--and th show gets so crowded so fast--I want to be in the first handful of people in the door. Before they opened the door--there were easily 200 people in the line that was snaking into the road. This show has no crafts and repro stuff. None. They do allow dealers to use a bit of seasonal decoration--but that is not the focus. No "My Grandma is My Favorite Antique" pillows from China allowed. No booths of kitchie candles or bags of potourri. All old stuff. And well displayed. Good bathroms and good food round out the show. This year they had warm" baked in a church kitchen" cinnamon rolls that came out of those old big pre-crockpot Nesco brand cookers. One of those and cup of coffee and a chair helped to fortify us for another go-round on the selling floor. This is a show like yesteryear--and hour into it--the building is jammed with patrons and you sometimes are shuffling in the aisles to move to another booth. What recession? We bought well this year. That means we found interesting things--priced so we can turn around and make a profit when we sell them in our antique shows in the upper midwest this spring and summer. We'll go back next year--if for nothing else than one of those cinnamon rolls. Old habits are hard to break--and it is March and that has meant--at least since 1989--every March-- an antique buying trip to the UK. Just as a Chicago March is roaring in like a lion---my least favourite weather month--Husbola and I would head off to London to start a 2-3 week buying trip. Planning for the trip would start in the late autumn--we would rent flats from a variety of sources. Whenever possible, we would stay in the Sloane Square area of London. This is a green, leafy and quite chic area of London and we would rent a flat that was usually the size of a ravioli. For years we rented the top floor--no lift--from Helene. This flat was housed over a nursery school with young children all dressed alike singing songs in the early morning. The three wheeled milk truck delivered itty bitty bottles for their consumption sometime later in the morning. Then we moved across the street to Sab's place. Sab was a wonderful Iraqi English gentlemen who had a huge townhouse filled with rooms that he rented cheap. And he loved Americans. We could call Sab at the drop of a hat and he would rent us a flat. This was steps away from the tube, any bus to the London environs and post office-food-favourite Indian restaurant--everything. But nothing stays the same. Sab and his family grew tired of the London hustle bustle--and--smart man--he sold his flat back to Lord Cadogan for 3M (that's pounds!) and moved to Surrey. Our next landlord was a rental agency called A Place Like Home. They have beautiful flats in the neighborhoods we like--that are well maintained-most comfortable--and of course--more expensive. Staying with them--we were able to try a new one each year--but all within the favourite neighborhood. The key for us to be able to buy abroad is a comfortable flat--that is convenient to transport and our shipping supplies and our reliable shipping man located further down the King's Road. After a day of slogging on the trains and buses and bringing home the treasure--we wanted to be able to shop for an easy dinner and be in a safe and quiet (for London standards) neighborhood. So --why not this year? I am not quite sure. The pound versus dollar conversion is very attractive at $1.49 to the pound. Just a few years ago it was $2.12 to the pound. The usual assortment of antiques fairs is going on this spring--Ardingly, Shepton Mallet, Taunton, Bingley Hall in Stafford, East of England Showground at Peterborough, Horticulture Hall--the list goes on and my mouth is watering. But what to buy? That is the million pound question--what to buy. Our last two trips--while enjoyable-did not glean all the items we wanted to buy. Items we would have bought over the years--just aren't selling back here in the states like they used to. Staffordshire pottery, brass, copper and textiles are slower sells than they used to be. And everybody--here and there--are looking for good paintings and quirky decorative things. More squirrels are chasing the same nuts. And the cost of shipping has skyrocketed. No England for us this spring--but Husbola and I are already giving a little thought to autumn travel--when it is in your blood--it is hard to drop it cold turkey!